The Elder Scrolls Online is heading to Sotha Sil's Clockwork City for a ten-hour expansion, due out on October 23. The update is included as part of the ESO Plus membership, and otherwise costs 2000 crowns in the in-game Crown store. That's roughly $20 / £15 worth of crowns once you've converted the amount from real money. According to the TESO site, the pack adds a standalone story "similar in size to the main quest lines found in the Dark Brotherhood or Thieves Guild DLC". The story focuses on a conflict between Daedric Princes that threaten to pull you into the realm of Oblivion at points during the adventure. 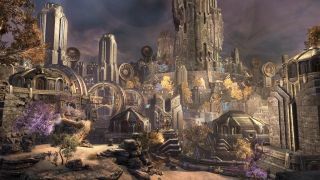 The update seems to otherwise be largely set in the mechanical clockwork city, built around a hub area called the brass fortress. The DLC works alongside the upcoming update 16 to add a new transmutation system that you can use to alter traits on your gear. The transmutation vendor will be based at the heart of the brass fortress. Update 16 will make plenty of other changes. In addition to balance updates and bug fixes the update also adds a new battlegrounds mode called Crazy King—a one-point capture mode in which the point randomly shifts mid-battle. A prologue quest is now live in TESO. Here's how you get it: "Players can travel to any local Mages Guild headquarters in Tamriel to find a note on a table titled “Order of the Eye Dispatch.” Reading the note will give the quest “Of Knives and Long Shadows,” and send players on their new adventure." Catch a few clips of the Clockwork City in this year's The Elder Scrolls Online E3 trailer.